I was born outside of Detroit, Michigan, the youngest of three children of a pianist mother and mathematician father. When I was only a few weeks old my mother, while rehearsing with Detroit symphony concertmaster Mischa Mischakoff and principal cellist Italo Babini, discovered that I would stay asleep as long as they kept playing. This was obviously a good deal for them, so I heard a lot of music close up when I was very young! In 1st grade, a test found me seriously lacking in small motor coordination which helped convince my parents that I was cut out for a life of science (and klutzdom.) When I was 8, we fled the snows of Detroit and moved to Phoenix, Arizona -going from freezer to frying pan. Despite their good faith efforts to steer me towards science, one day in 4th grade after a school music demonstration, I came home and told them I wanted to study the cello. Unfortunately for them, they said yes... Not long after this, at age 10, I also began taking some college courses in mathematics and German at Arizona State University. The unusual situation produced a brief boom of articles in the national media describing me (with considerable embellishment) as a 'precociously mature genius.' These old articles are read today with amusement by those who know me as a steadfastly immature adult who has been known to get lost counting to four. With limited options for cello teachers in Phoenix at that time, my parents heroically chose to drive me 100 miles every other weekend for lessons in Tucson with Gordon Epperson. Gordon was a kind and generous man, who took me through much of the basic cello repertory for the first time and I am indebted to him. And at the same time, I had the great benefit of continued contact with Detroit Symphony Principal Cellist, Italo Babini, occasionally flying to Detroit for lessons. 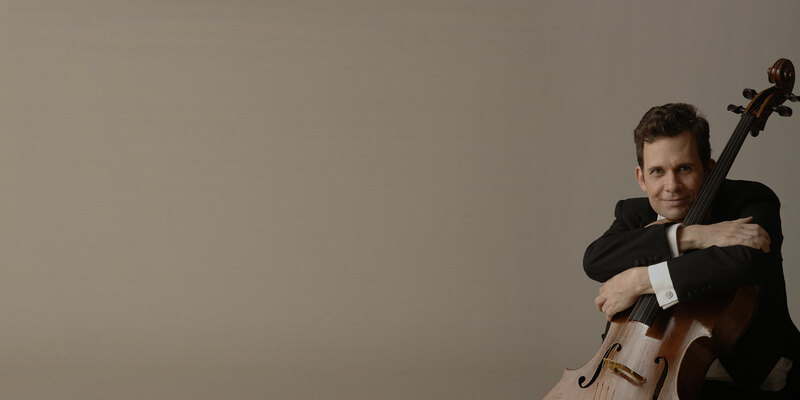 Italo is a great musician and cellist, and has been a lifelong friend and mentor. Italo first introduced me to the recordings of Heifetz and of Feuermann, and taught me many of the musical values that shaped the rest of my life. At age 14, I officially became a high school dropout when I began full time study at ASU. I had my heart set on being a cellist, but my parents -knowing how difficult it can be to find a job in music- strongly encouraged me to get a degree in something 'practical' first, so I completed my B.A. in Mathematics when I was 17. During these years in Phoenix, my parents had also formed a friendship with the great cellist Leonard Rose. He became a regular house guest whenever he passed through Phoenix, and occasionally performed with my mother. At that age I failed to fully appreciate who he was, or how lucky I was to have him practicing in my living room and giving me bits of advice, but I still feel very lucky to remember him as the kind-hearted, gentle guest who cut the Thanksgiving turkey. At 16, after several years of intensive concentration on my college coursework, I had significant deficiencies in technique and repertoire, but Eleonore Schoenfeld in Los Angeles accepted me as a student and I began flying to Los Angeles for lessons with her every other weekend. When I graduated from ASU the following year, I wanted to keep studying with her, and the simplest and cheapest way to do this was as a math graduate student and teaching assistant at the University of Southern California. There, I found myself a 17 year old über-nerd teaching basic algebra to a class of USC seniors who had majored in being awesome. If any of my math students from those years should somehow find and read this, let me just say... I'm sorry!! Eleonore rescued me as a cellist and in three and a half years, moved me through almost all the major repertoire (a month before my first lesson I received a package from her in the mail containing five major concertos and sonatas and a note reading "Dearie- please have these memorized for you first lesson" !) But at the same time I was becoming increasingly discouraged with what I saw of the music world, which often seemed more self-gratifying than idealistic. I was on the brink of abandoning music to concentrate on physics (or perhaps play electric bass in an Echo and the Bunnymen cover band) when Sammy and Winnie Mayes -who had become family friends when they retired to Phoenix- strongly encouraged me to spend a summer at Aspen studying with Zara Nelsova. Thinking this might well be my last major musical undertaking, I grudgingly agreed. Zara turned out to be one of the most inspiring people I've ever met -both musically and personally- and meeting her changed my life. As a student of Casals, Feuermann and Piatigorsky and a great cellist in her own right, Zara was a link to the old style, and an inspirational role model. She was not an easy teacher in lessons- she told almost every student that they didn't have enough technique and sent them off to practice the insanely difficult Greutzmacher Etudes, Vol. 2. (Years later, after I had finally convinced her that I really had learned all the Greutzmachers well enough to at least get through them, she went into her music closet and came out with a book of even harder etudes!) But there was never a moment of doubt that behind the demanding standards, there was incredible warmth, compassion and support. After meeting Zara in Aspen, I changed course and moved to New York to study with her. I ended up staying at Juilliard for 5 years, until I had finished doctoral coursework and run out of degree programs and excuses to stay. There are many people I'm indebted to, but aside from my parents, no one more so than Zara, and I know so many of her former students share that feelings. There's rarely a day when I don't think of her. The time at Juilliard also introduced me to many great musicians who became colleagues and friends, including my fellow doctoral student, pianist Evelyn Chen who -unable to avoid me in the confines of the Juilliard Library reading room- eventually gave in and became my wife. Towards the end of my last year at Juilliard I was fortunate to win one of my first orchestral auditions, for the principal cello position in the San Diego Symphony. I knew next to nothing about playing orchestra excerpts and was, honestly, not a very good orchestral player. However I was just coming from playing the Dvorak concerto in my first professional engagement (courtesy of Hal Weller) so I was in good overall shape and San Diego was, luckily, willing to take a chance. During my first year there, my colleagues patiently educated me on the mysteries of orchestral playing. I learned quickly that a good deal of leadership is learning to put your ego aside and learn from those with more knowledge and experience! During my second year, the symphony suffered serious financial difficulties and filed for bankruptcy. This threw me, still fairly orchestrally ignorant, back onto the audition circuit, where I quickly realized that most orchestras weren't actually just looking to hire whoever played the fastest Dvorak concerto! I was happy and relieved to win a job as the principal cellist of the Fort Worth Symphony, and fortunate to arrive there just as they were entering a major growth phase in their history. I ended up staying for six years in Fort Worth and they were important formative years for me. I also gained some of my first teaching experience at Texas Christian University, where some of my poor 'guinea pig' students suffered through 4 hour lessons! In time, the desire for broader experiences in repertoire, conductors, and the life of the biggest orchestras took hold and I left Fort Worth to take a position in the section of the New York Philharmonic. It was a chance to join Carter Brey and a very impressive group of cellists, many of whom were old friends from school days, and I learned a tremendous amount from all of them. I enjoyed my time there and had mixed feelings about leaving after only three years, but the Houston Symphony is a great orchestra and when the opportunity to move to Houston as principal came up, I couldn't pass it up. I enjoy working with many inspiringly gifted and devoted colleagues here, from whom I constantly learn, and the chance to work with the great teachers and students at Rice University's Shepherd School has been an incredible bonus. Evelyn and I now live in Houston with our daughter, Calista, two slightly evil but kind-hearted dogs and the normal human collections of hopes and fears. I feel incredibly fortunate to have a musical life that allows me to accept many opportunities to work as a soloist and chamber musician, as well as an orchestra musician and teacher, but what ultimately motivates me every day is the hope and desire to improve. It's exhilarating when, after years of trying, you finally figure out how to do something better, and it is the continuing search to find ways to do better by the music that has kept me excited and interested. By temperament and education, I believe strongly in the string playing style from the first half of the 20th century- particularly of Heifetz, Kreisler, Casals and Feuermann. There are unquestionably many great instrumentalists today, but the flowing tempos and long lines, the individual character of vibrato and sound and the artful use of glissandi are much rarer than they once were. I don't claim to have all the answers - I struggle with this 'dead tree with no leaves' like every other cellist- but I am fascinated by the pursuit of this ideal and I hope to be able to learn and share as much as possible. Please see writings for more thoughts on this, including a link to my doctoral thesis on Feuermann. Thanks for your interest.